At the same time, a series of professional fights took place - Armfight # 49. In Armfight, three representatives of the host country of the tournament, Manuel Battaglia, Marco Gioco and Angelo Varchetta, pulled with representatives of Poland (Alex Kurdecha), Bulgaria (Plamen Dimitrov) and Croatia (Viktorio Sovich). Unfortunately for the local audience, not one Italian was able to win his armift. We would like to note the efforts of the Italian Armwrestling Federation - the tournament is getting better in every direction - organization, level of participants, venue and other. The tournament became truly international, 150 participants from 14 countries took part in it! It is also important that this year for the first time Super Match hosted para-athletes, this is another step for the development and popularization of our sport. Super Match is an international event in the world of arm-wrestling and it is possible to take part in it not only professionals and athletes with great experience, but also newcomers who would like to try themselves in this sport, because for them separate categories have been singled out. 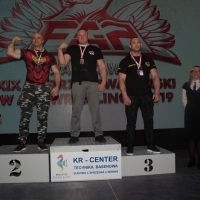 Thanks to such tournaments, arm wrestling becomes more accessible and understandable for a growing number of people and everyone can become a part of this wonderful sport.